Yagi antennas focus the transmit and receive power in a single direction. 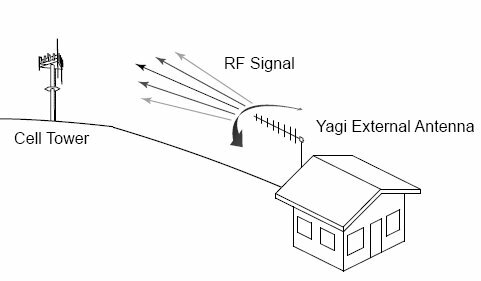 Higher gain Yagi antennas are frequency specific so you should consider the frequency range of your phone, service provider and/or amplifier system in your particular area. A Yagi is best used for fixed locations such as homes, offices, warehouses, farms and remote locations trying to reach far away cell sites in a particular direction. They should be mounted as high as possible on a tubing or pipe such as used for outdoor TV antennas. For best results, consider installations that make the cable as short as possible yet placing the Yagi where it gets the best signal. These Yagi antennas are typically frequency specific (800MHz or 1900MHz). You must match the antenna frequency with the frequency that your service provider is using in your area. Although most carriers (and phones) can use multiple frequencies, a service provider usually uses only one of these frequencies in one particular area. 800MHz higher gain antennas improve transmit and receive signals for used by Verizon, Alltel, US Cellular, Cellular One, Cingular, Nextel, SouthernLINC, Bell Canada, Telus, Mike and all other Cellular and iDEN carriers.